Uniforms are optional –students may purchase uniforms for $30 (regular price is $35). PLEASE MAKE CHECKS PAYABLE TO JEANIE GENSHEIMER MARTIAL ARTS. The Instructor: Sensei Robert Bilek, – 3rd Degree Black Belt under the leadership of Master Jeanie Gensheimer, 7th degree black belt in karate. 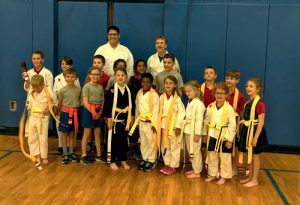 The Program: Students begin as white belts and progress through the belt ranks. Continuing students will work on their new rank material for their next belt. The Benefits: Self control, coordination, confidence, self defense, goal setting, cooperation and decision making skills. *K kids will be assessed to ensure required self control!